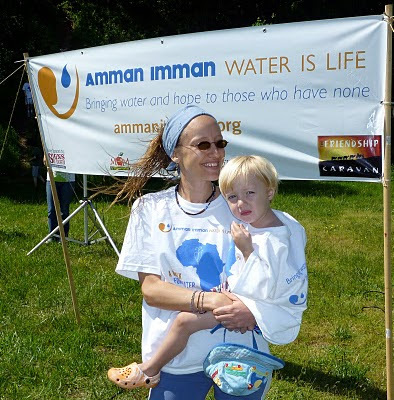 On May 15, 2010, Amman Imman: Water is Life held the 4th annual A Walk for Water at Lake Frank in Derwood, Maryland. More than 200 people, from several schools and organizations, walked over 3 miles around the lake in solidarity for the children and families in the Azawak who walk over 30 miles in a day for water. This year some special guests joined the students and their families. Ariane Kirtley and her son Fassely were in town directly from Niger, where Ariane and her husband Denis had been working for the last 5 months. Her presence meant a lot to the students who had been supporting Amman Imman over several years. Finally, they had the chance to meet the person who has dedicated her time and energy to bringing water to the Azawak of West Africa. By her example, they are learning about their own boundless capacity to change the world. Through online donations and sponsorships, over $7,600 was raised. The money will go towards finishing the Kijigari borehole, under construction in the Azawak. This borehole structure will supply water to 25,000 people and animals for the next 50 to 100 years. Watch this video on YouTube to see pictures and learn more about A Walk for Water 2010 at Lake Frank! Wow!!! this is really inspiring!!! Thanks organizers and participants. "water is life" -- Well, that's definitely true! We can't survive without water! They have a kind and helping heart for needy people.